The 43 page report offers a comprehensive look at how Top Performing organizations are justifying investments in marketing automation and exactly how these organizations utilize the tools. It’s an exciting time for marketing automation because the technology has officially been validated and we have moved beyond the early adopter stage into a wide variety of applications across all industries. 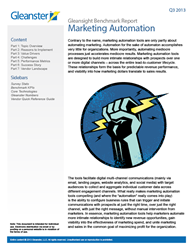 Gleanster Research today announced the publication of a new Gleansight benchmark report on Marketing Automation featuring vendor reviews for over 50 solution providers. The 43 page report, which can currently be downloaded for free, highlights the experiences and intentions of 220+ B2B companies and offers a comprehensive look at how Top Performing organizations are justifying investments in marketing automation and exactly how they utilize the tools. Top Performers are embracing more advanced capabilities like lead scoring and email triggers that help them build more meaningful relationships with prospects and customers. They are also looking to divest of fragmented marketing technologies which lead to disparate and often unusable customer data. The vendor landscape section features reviews of over 50 vendors and an analyst perspective on the tumultuous changes in the industry, including two IPOs (Eloqua and Marketo) and a few large-scale acquisitions from suite players like Oracle and Salesforce.com. “It’s an exciting time for marketing automation because the technology has officially been validated and we have moved beyond the early adopter stage into a wide variety of applications across all industries.” Adobe Neolane, Act-On, eTrigue, HubSpot, Infusionsoft, LeadLife Solutions, Marketo, Oracle Eloqua, Pardot, Salesforce.com, and Silverpop take top honors across four key dimensions of assessment. Gleanster is a new breed of market research and advisory services firm. Its larger, more comprehensive “Gleansight” benchmark research reports and concise, more bite-sized “Deep Dive” analyst reports highlight the experiences of Top Performing organizations; why they invest in technology, how they overcome challenges, and how they maximize the value of their investments. Gleanster also aggregates outside thought leadership in the form of vetted white papers and research reports from third-party sources, including those from technology solution providers — who, for their part, can create and maintain their own Vendor and Solution Showcases on Gleanster.com to help further educate the marketplace. For more information, please visit http://www.gleanster.com .